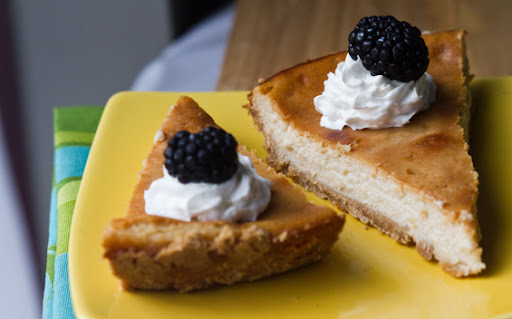 I've been craving a unique style of Vegan Cheesecake all weekend - one that is fluffier than your average slice - less dense - with a texture similar to a flan or custard. Something I could feel good about eating all summer long. 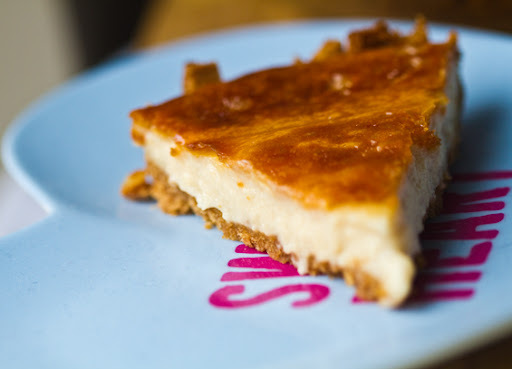 My recipe: Custard-Style Vegan Cheesecake - light and fluffy with a creamy-style bite perfect for summer. 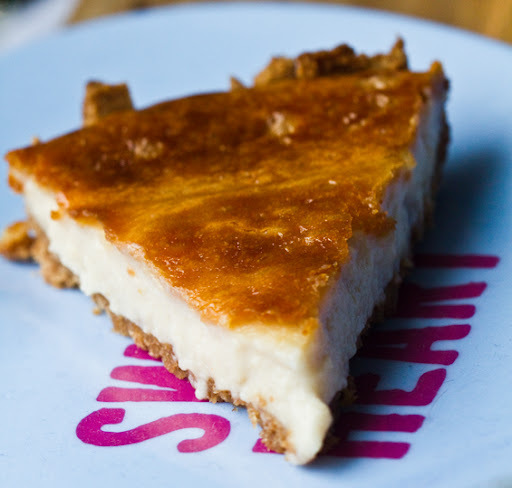 Serve warm or chilled for a more classic firm cheesecake texture. Recipe.. 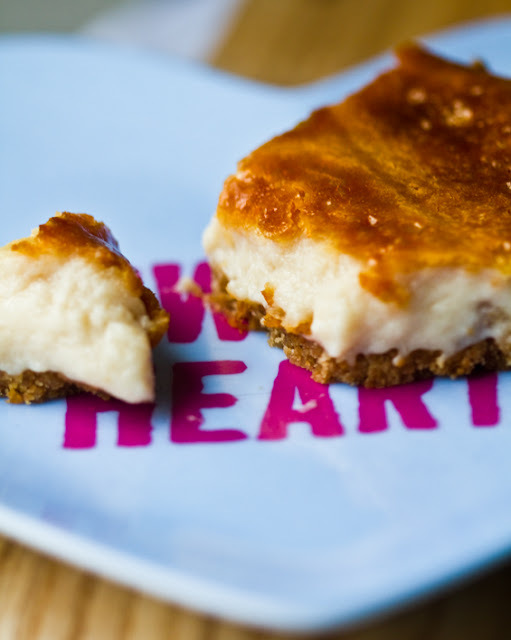 Serving Style: You can serve this cheesecake cool or warm. I actually served it warm (as shown in a few photos) for a optimal custard-like texture. 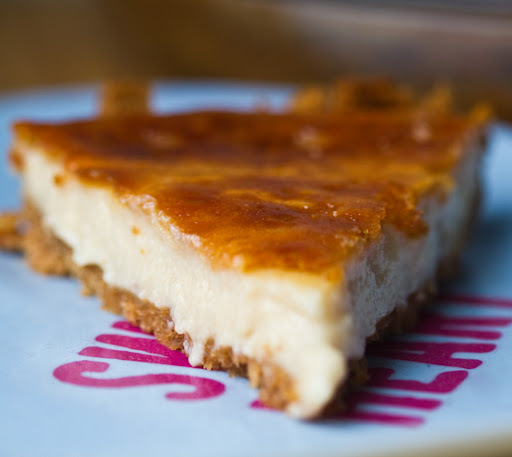 But if you allow it to fully set it will firm up even more to a more classic cheesecake style texture. I had some leftover filling, so I made mini cheesecake bites - stacked with strawberry jam and soy whipped cream. 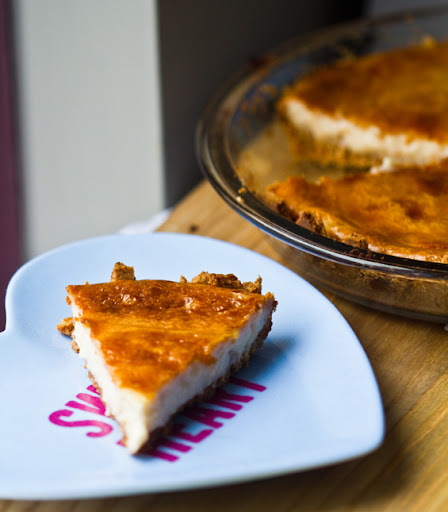 This photo also shows you how the cheesecake will look fully chilled. Get this "Strawberries-and-Cream Stacked Cheesecakes Bites" recipe here. Serving Suggestions: Top each slice with some fresh strawberry jam or cider caramel sauce for a lovely light dessert. * you can modify sweetener amounts slightly - depending on how "sweet" you want it. I did 1/2 cup sugar and 3 Tbsp maple. 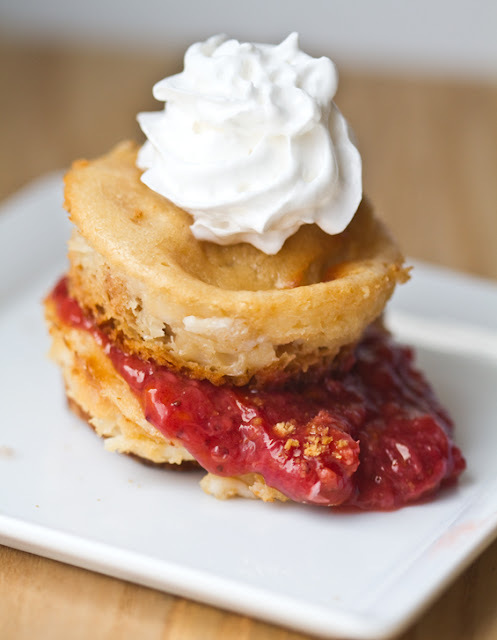 dish: I used a 9" pie dish - so I had about 1 cup leftover filling which I used to bake mini cheesecakes in muffin cups. If you use a deep-dish pan you won't have any leftover filling. 2. Combine the Ener-G Egg Replacer and set aside. 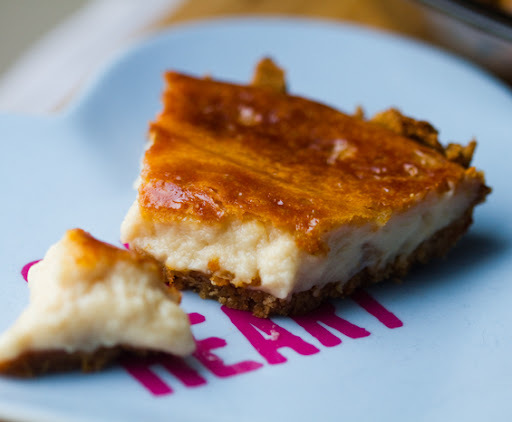 This is an optional step, but helps the fluffiness of the cheesecake. 3. 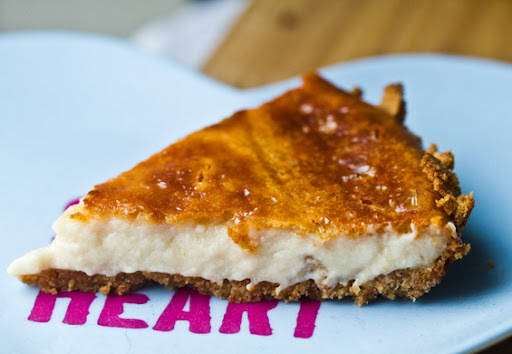 Combine all remaining cheesecake ingredients in a blender - blend until smooth. Add in egg replacer if using. 4. Pour filling into crumb-lined pie pan. 5. Bake at 375 for 45 minutes. Or until top begins to brown a bit. Note: I like that slight browning on top - if you do not, bake at 350 degrees for 55 minutes. 6. chill in fridge to allow cheesecake to set. 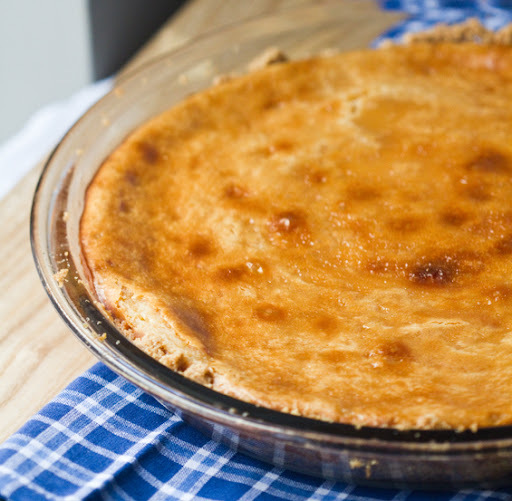 You can serve slightly warm if you'd like to savor the custard-style flavor. Serve with strawberry sauce, caramel sauce, chocolate sauce, fresh berries or as is! Want a More Dense Cheese Texture? Easy modification: Sub the silken tofu with 8 ounces of vegan cream cheese. 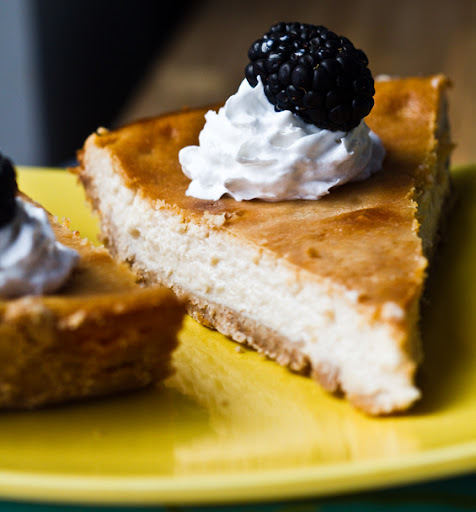 Want More Pie/Cheesecake Recipes? 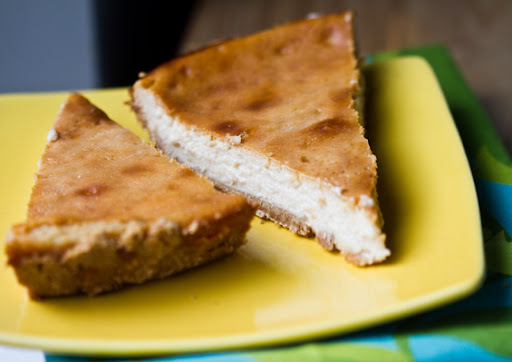 For a dense vegan cheesecake, try my Pumpkin Cheesecake Recipe. Or even my Chocolate Mousse Pie or Peanut Butter Pie (not cheesecakes, but still yummy rich slices).